At the Daily Planet, Clark is having a difficult time convincing Perry that the person behind the recent string of murders and fires is the Red Cloud. Because Red Cloud is a new villain, Perry questions Clark and tells him to investigate further. Clark and Robinson Goode come close to collaborating on the story before White calls the mild-mannered reporter into his office where he is shown a picture of Lex Luthor visiting Lois Lane at her new apartment. A flashback shows what happened two issues ago when Clark found Lois in disguise. Having returned early from the deep space adventure with Jor-El and Jon, Lois started thinking about her family. With her husband an A-list hero and her son a hero in training, there is no way her family could ever be normal, and that they should embrace that. She came to the decision that while her son is out growing and her husband is out being Superman, she'll get back in touch with herself by writing a book and living alone. Lois makes it clear that she and Clark will not be splitting up and that this is just a temporary thing. In the present, Copperhead is threatening to kill Daily Planet gossip columnist Trish over a story she had written. Superman makes quick work of the threat and catches up with his old friends. Later that evening, Superman goes to visit Lois, who has seen the gossip piece the Planet wrote Lex's visit. Lois and Clark go for a flight under the light of the moon. Story - 4: This is a rather sweet issue. It's nice to take a little detour from the Red Cloud story to focus on Lois and Clark's relationship. I'm interested in seeing what this new dynamic will bring to the book. We know Lois and Clark won't be splitting up, but this almost returns things to the pre-marriage status. It's like a pseudo reboot, much like how Spider-Man's been returned to student status in the current The Amazing Spider-Man series. The chemistry between Lois and Clark feels natural, though Lois says "baby" a little too frequently. For those who were worried that Bendis was going to break up the most iconic marriage in the history of comic books, this issue will (hopefully) set your mind at ease. Art - 4: Ryan Sook does magnificent work in this issue. The half splash of Superman and Lois kissing is absolutely gorgeous. The final splash page is beautiful and genuinely made me happy. In terms of action, there's a two-page splash that is absolutely superb. My favorite parts of this book are the quiet moments with Lois and Clark talking or a lonely Clark hiding out in the Daily Planet janitor closet. It all feels natural and it was easy for me to get sucked into the moment. That's what good art should do in a comic. 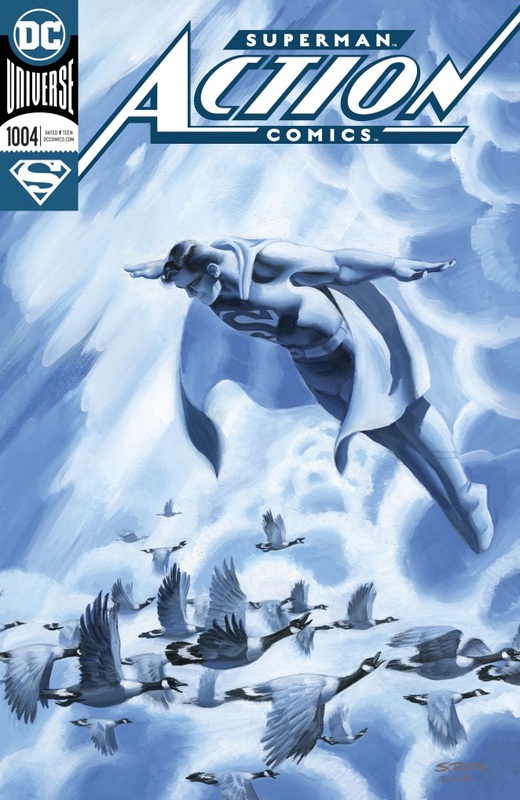 Cover Art - 5: If I had to make a list of my favorite Action Comics covers, this would absolutely make the list. The blues are just so soft and inviting. The art is magnificent. I'm not even upset that the cover doesn't reflect anything that happens in the issue. What really makes the cover pop is the foil gimmick. I don't know if this would work as well as a poster, but the foil effect really takes this piece from good to great. Manapul's Variant Cover Art - 4: I was tempted to pick up this variant. 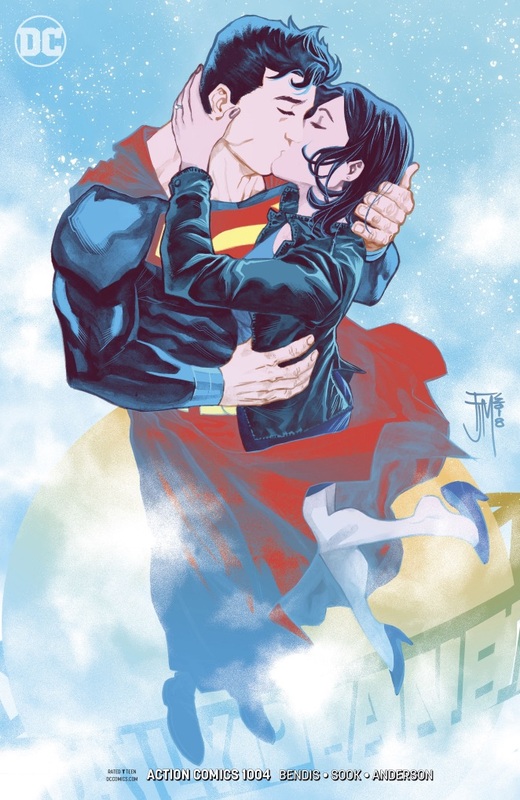 I'm a sucker for covers with Superman taking Lois for a flight. The colors are vibrant and the line work is clean. My only issue is with everything below the belt. Lois and Clark's legs look a bit off, as if Manapul had a hard time deciding on how they should look from that perspective. Other than that, it's a beautiful piece.